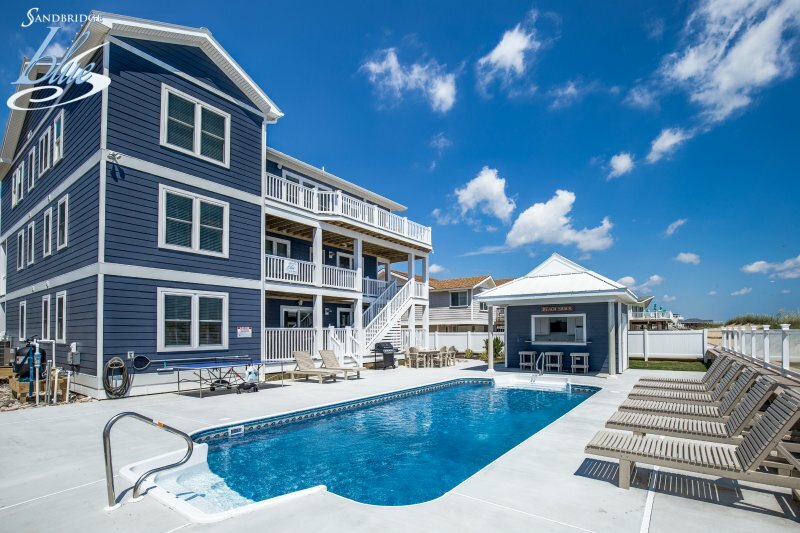 Jim N I Dream is an oceanfront rental for your whole family to enjoy, filled with beautiful furniture, appointments, and with colors and textures as light as an ocean breeze! 9 Bedrooms give you family gathering room for all and 7 bedrooms are private masters! Looking for outdoor space? You will flip over the private pool, hot tub, outside cabana bar, full size refrigerator, sink, and TV for the big game! Grill, watch sports, play ping pong, hang out poolside at the bar, soak in the hot tub or lie by the pool…the whole family can enjoy this outdoor area. Did you see those decks? Sturdy, hardy deck furniture is comfortable and relaxing…you may never get to the beach! Inside, the kitchen is a cook's paradise, with plenty of room for everyone to get involved with ample countertops and a huge island overlooking the great room, dining area and the pristine Atlantic Ocean. Ground Level offers a full size pool table with a kitchenette that has a mini fridge, dishwasher and microwave…maybe the kids will clean up after themselves! The media area has comfortable seating and a LCD TV they can use for movies, games or to set up their devices for streaming. The access leads to a gated patio with a gate between the pool deck and patio…an extra safety feature. In between are 9 gorgeously outfitted bedrooms with bathrooms that offer custom tile and privacy. The elevator makes it easy to get between the three, and one bedroom has a bathroom with larger door, roll in shower and roll under sink. We hope you make Jim N I Dream your family's dream too! Top-Level: Great Room with LCD TV, DVD, Electric Fireplace, Deck Access with Ocean View, Kitchen with Granite, Double wall oven, island cook top, 2 Stainless Steel Dishwashers, 2 oversized Stainless Steel Refrigerators over Freezers, Bar seats 3, Dining Table seats 12, Dining Table seats 6, Half Bathroom, King Master with LCD TV, Whirlpool, and Shower; King Master with LCD TV and Shower. Mid-Level: Master Bedroom with Double Bunk Bed and Twin Bunk Bed, LCD TV and Deck Access; King Master with LCD TV, Jetted Tub/Shower with Tile and Deck Access; King Master with LCD TV, Large Tile Shower, and Deck Access with Ocean View; Queen Master with LCD TV, Roll in shower, Roll Under Sink, and Deck Access; Laundry with 2 Washers, 2 Dryers (Full Size Stackable). Jim N I Dream is an oceanfront rental for your whole family to enjoy, filled with beautiful furniture, appointments, and with colors and textures as light as an ocean breeze! 9 Bedrooms give you family gathering room for all and 7 bedrooms are private masters! Looking for outdoor space? You will flip over the private pool, hot tub, outside cabana bar, full size refrigerator, sink, and TV for the big game! Grill, watch sports, play ping pong, hang out poolside at the bar, soak in the hot tub or lie by the pool…the whole family can enjoy this outdoor area. Did you see those decks? Sturdy, hardy deck furniture is comfortable and relaxing…you may never get to the beach! Inside, the kitchen is a cook's paradise, with plenty of room for everyone to get involved with ample countertops and a huge island overlooking the great room, dining area and the pristine Atlantic Ocean. Ground Level offers a full size pool table with a kitchenette that has a mini fridge, dishwasher and microwave…maybe the kids will clean up after themselves! The media area has comfortable seating and a LCD TV they can use for movies, games or to set up their devices for streaming. The access leads to a gated patio with a gate between the pool deck and patio…an extra safety feature. In between are 9 gorgeously outfitted bedrooms with bathrooms that offer custom tile and privacy. The elevator makes it easy to get between the three, and one bedroom has a bathroom with larger door, roll in shower and roll under sink. We hope you make Jim N I Dream your family's dream too! Top-Level: Great Room with LCD TV, DVD, Electric Fireplace, Deck Access with Ocean View, Kitchen with Granite, Double wall oven, island cook top, 2 Stainless Steel Dishwashers, 2 oversized Stainless Steel Refrigerators over Freezers, Bar seats 3, Dining Table seats 12, Dining Table seats 6, Half Bathroom, King Master with LCD TV, Whirlpool, and Shower; King Master with LCD TV and Shower. Mid-Level: Master Bedroom with Double Bunk Bed and Twin Bunk Bed, LCD TV and Deck Access; King Master with LCD TV, Jetted Tub/Shower with Tile and Deck Access; King Master with LCD TV, Large Tile Shower, and Deck Access with Ocean View; Queen Master with LCD TV, Roll in shower, Roll Under Sink, and Deck Access; Laundry with 2 Washers, 2 Dryers (Full Size Stackable). Ground-Level: Rec Room with Full Size Pool Table, LCD TV, Game Table, Kitchenette with Mini-Fridge, Dishwasher, Microwave, Table seats 6, Access to Patio leading to Pool Deck, Bedroom with Double Bunk Bed and Sleeper Sofa and LCD TV; King Master with LCD TV, and Shower with Seat; King Bedroom with LCD TV, shares access to Hall Bathroom Extras: Private Pool (15 x 31), Hot Tub (6), Elevator, Wireless Internet Access, DVD player, Full Size Pool Table, 3 Dishwashers, 3 Refrigerators, 2 Microwaves, Fireplace, Gas Grill, No Smoking, PETS NOT ALLOWED, Parking: 9 Cars Additional amenity details: Private pools are open from May 3, 2019 until October 6, 2019. This property is not equipped for pool heat. Pool heat is not an option for this property. Hot tubs are available from March through December. All Sandbridge Blue properties provide bed linens, bath towels, beds made prior to your arrival, and a starter supply of: toilet paper, bathroom soap, paper towels, and dishwater detergent.